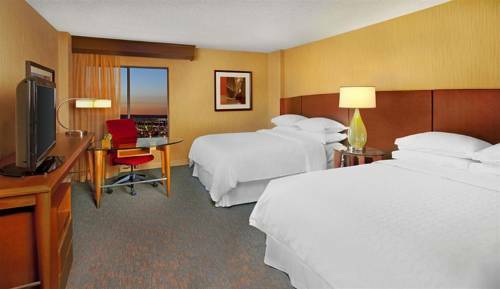 Rejoice in a comforting stay at Sheraton Albuquerque Airport Hotel. Our renovated hotel offers relief in your travels with a paramount location near Albuquerque International Sunport. We are pleased to offer easy access to popular spots such as The University of New Mexico, Kirtland Air Force Base and Nob Hill. Following a day of traveling or exploring, check in to our stylish rooms featuring free high-speed Wi-Fi, ergonomic workstations, flat-panel TVs and luxury bedding. When you're ready to brave the day, fuel up at our onsite restaurant and bar, Left Turn at ABQ and LT Lounge. While exploring the outdoors of Albuquerque might be at the top of your to-do list, we offer impeccable amenities that make it alright to stay indoors. Opt for a workout in our fitness center featuring cardio equipment and free weights. If you're looking for a nice glow from your New Mexico vacation, plan for a day poolside. There's no limit to relaxation when you reserve accommodations at Sheraton Albuquerque Airport Hotel. Left Turn at ABQ and LT Lounge: Casual yet refined, our Albuquerque restaurant near the airport welcomes you to experience the true New Mexico dining scene at our hotel. Our menu highlights local ingredients and favored recipes that unite flavors from all around the state.